Media Systems installation services. We supply, install and demonstrate easy to use media systems in your home. You can enjoy your video, photos, music, and the internet, on your TV / Home Cinema System, iPad, tablet or PC. Media Players: Blu-ray Media Players, WD, Apple TV, PS3, Xbox, Chrome Box, PC, DLNA, others. Media Storage: Networked, NAS, cloud, QNAP video media servers, PC backup solutions. Home Networks: Unified dual band wireless home networks, Powerline, Homeplug, wireless access points. 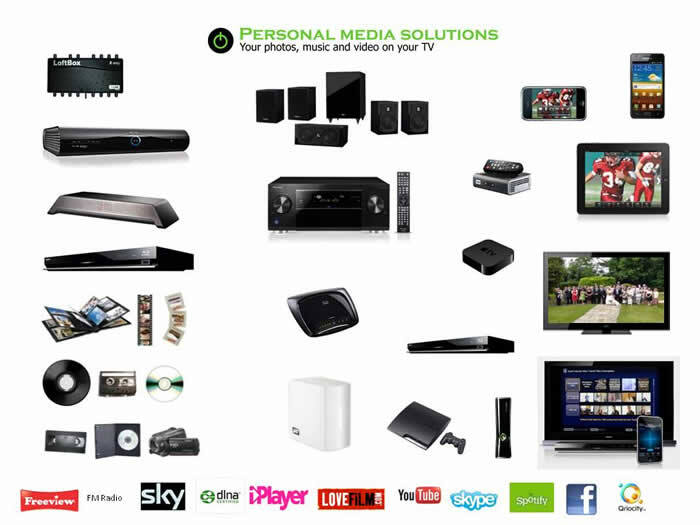 Home Entertainment Systems: TVs, AV Amps, Surround Sound, Sky, Virgin, Slingbox, DLNA. Internet on your TV: iPlayer, Netflix, YouTube, Facebook, Skype, Spotify. Mobile, Tablet solutions: Mirror to TV, AirPlay, Control of Home Entertainment, Wi-Fi extensions.